Our last full day on the South Island beckoned. We decided to do one last ‘big thing’ while here. It’s always so easy to bury the last day or two by staying put – chilling at the accommodation or strolling into whatever town we were nearby – pottering – as they say back home. Our target was 50 kilometres north of us, the southern shore of another great lake but as Aerosmith once sang “Life’s a journey not a destination”. So let us talk about that. The first challenge on our adventure was to navigate the Crown Range Road and its zig-zag like twists and turns (20 of them) as we scaled the mountain. Very taxing on the hire car but totally worth it for the view it bestowed at the top. A reward for such concentration. After that it was a smooth drive down into the Cardrona Valley, passing fertile farms left and right before stopping for breakfast in the village of Cardrona itself and a visit to it’s famous hotel. More than 154 years old, its a quirky kind of place. Lots of old fashioned treasures and trinkets indoors, it even has a mine-shaft in the middle of the bar – safely behind a window these days. When you walk out onto the back porch you are transported to a little corner of Kent with an amazing beer garden. The breakfast was really really good too. The only hint that you are in the 21st Century is the Tesla Charging station across the road. 2km up the road is the turn off to the Cardrona Ski-Field and, on the other side of the road is the famous Bra Fence. Before we headed into Wanaka Central we took a few detours. The first was our maiden trip to a Lavender Farm. Set across 10 acres of land there was a lot of Lavender. A lot. Rows upon orderly rows of faded purple flowers arrayed like a Seven Nation Army. What the photos don’t betray is the ton of bees that were in residence. Like there was a lot of bees. It reminded me of the film the Wicker Man. But luckily there were no gigantic monuments of straw and cultish locals. Instead we found a Lavender Tractor that allowed for some special photos to be taken. As well as the Lavender there was a working farm with cows, pigs, alpacas and a whole warren of beehives. (Their other venture was to sell branded Lakes Honey from the shop). Our second detour was unfortunately closed. Ground Up Brewing is a small brewery on the outskirts of Wanaka that is owned by an English ex-pat whose brother works with Karen. When we said we would be heading to Wanaka we grabbed the name and had a plan to visit the brewery. Next time! What was once a sleepy ski and summer resort for the inhabitants of Queenstown and Canterbury is fast becoming New Zealand’s next city. 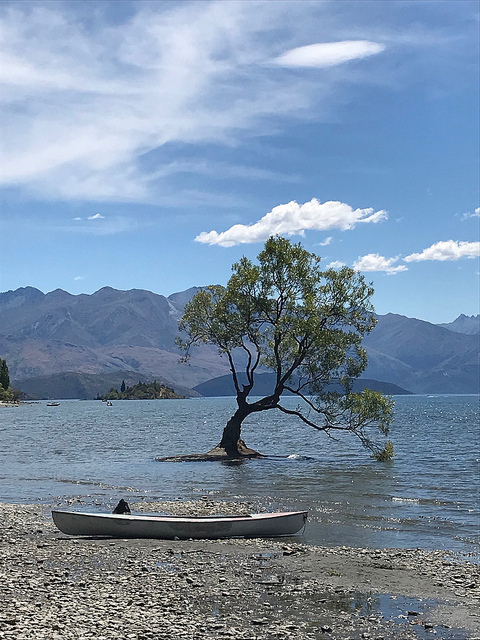 Located on the southern shore of Lake Wanaka this historical Maori fishing spot was a pure delight on this summer’s day. A long track leads around the water and we followed it with gusto. 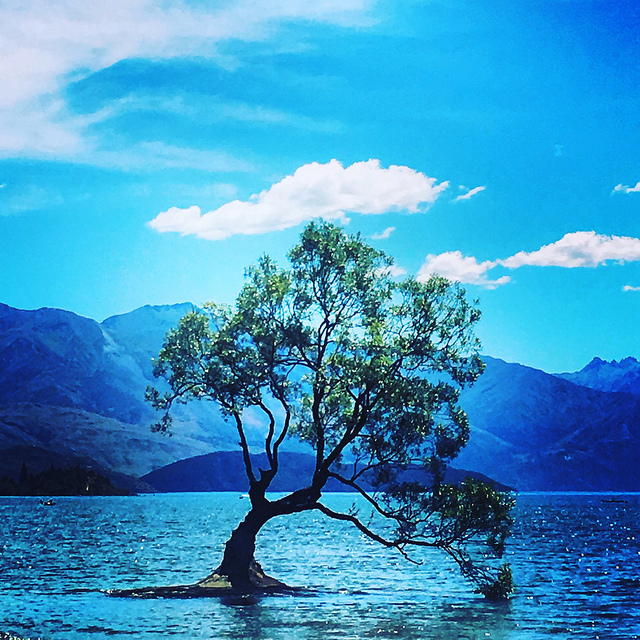 It’s only a Willow Tree with wet feet – one of millions of others, but its location on the south-easterly shore of the Lake (in a pocket called Roys Bay) has allowed tourists, serious photographers and basically anyone with a lens to conjure up a mystique surrounding the sole tree. So here it is – John’s entry to the great gallery of #ThatWanakaTree – complete with canoe in foreground. And another with one of those #Instagram filter treasures from Karen. We kept walking along the lakeshore path, almost back out of the town before we reached our destination. A small pathway that led back uphill, away from the water. This was the back entrance into Rippon Winery, at least we thought it was. For 10 minutes all we saw were brambles and dirt but our perseverance paid off as the view opened up and we saw the vines and the cellar door, majestic atop a nearby hill. Our reward came in the form of a special wine tasting. That morning a number of wine critics, no doubt including James Halliday and his cohorts, had descended on Rippon to sample their wares and give their most critical of verdicts. Therefore there was tons of really nice plonk, open and going to waste. Our sommeliers did not hesitate in sharing it out amongst the group of us that formed. As we left we took in the view. The wine was not the only thing to drink in that fine afternoon. Set atop a hill we were given a commanding view of the Lake below, Ruby Island in the foreground and beyond the wider lake, Mount Burke and a great skyline. Back in town we managed to make up for the earlier disappointment at the closed brewery by sampling one of their flagship beers, Kiwi Pale Ale (The KPA) with our lunch. ..and I take the Low Road! We opted out of taking the direct, high road back to Arrowtown. Back towards Cardona and down the accordion like Crown Range Pass. Google Maps showed us another way. The Scenic Route not always taken. Down State Highway 6 towards the town of Cromwell and then hooking a huge right along the Gibbston River Valley and its wineries (where we cycled to the day before). And that was that. A really great 10 day trip of (part) of the South Island of New Zealand. Some of the best scenery and landscapes we have ever experienced before. Great food and fun times.